In fact, according to Pfizer Canada — the nation's leading biopharmaceutical company — adopting healthy habits can start with just a smidge™ of inspiration, motivation and support. 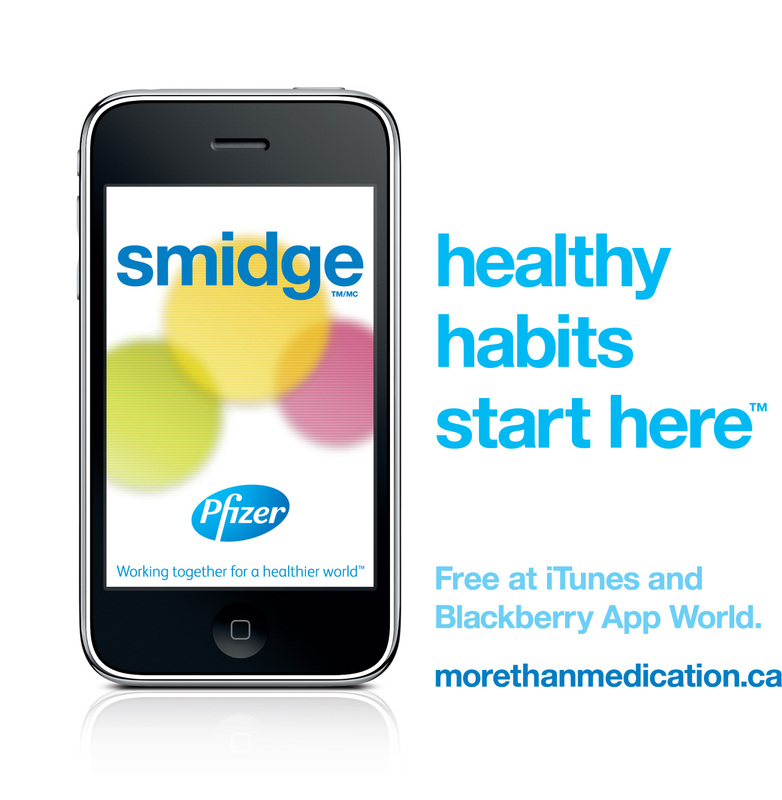 Today Pfizer Canada introduces its first-ever "app" and health motivator — smidge™. smidge™ is available as a free "app" and can be downloaded on iPhones, iTouches, iPads and Blackberries. A first for Pfizer Canada, smidge™ identifies and celebrates small, easy actions that impact the body, mind and spirit. As you build momentum over a 21-day period, smidge™ shows you how to do just a little bit more by choosing across six activities that include: Be Positive, Eat More Fruits and Veggies, Train Your Brain, Take the Stairs, Deep Breathing and Drink More Water. Developed with the support and assistance of leading Canadian experts that include medical doctors, stress experts, life coaches, fitness trainers, dietitians and nutritionists, smidge™ embraces the philosophy that it's more helpful to focus health choices on small, sustainable steps as opposed to trying to incorporate large, sweeping health goals all at one time. "People have busy lives and sometimes, we don't take the small wellness steps that will keep us healthier over our lifetime," says Ghislain Boudreau, Vice President of Public Affairs and Stakeholder Relations at Pfizer Canada. "Canadians told us they want to build healthier habits, but they just weren't sure where to start. smidge™ motivates you to start taking small, positive steps that pay-off over the long-term. It's simple, rewarding and fun," he says. smidge™ was created to let Canadians move at their own pace. You can do the activity as often as you like; set up reminders; track your progress; share your accomplishments with friends on Facebook, Twitter and via email. "Small, consistent changes build momentum and most importantly, change your focus from future "someday goals" to what you can do this minute, right now, today," agrees Dr. David Posen, a Toronto-based MD, stress management and work-life balance expert and author, who particularly likes smidge™ reminders and motivational messages. Looking to lighten up and manage stress better? Sign-up for a daily breathing exercise that helps to remind you to breathe and tune in every day. "Breathing deeply is fundamental to good health and creates beneficial physiological changes in the body. smidge™ is a great way to focus on your breath every day," says Dr. Posen. "Once you've begun to build momentum, you can start incorporating other small changes, like taking a deep breath at stop lights," says Dr. Posen. "All this will help you work up to a deeper, longer breathing practice 2-3 times a week. Get started with smidge™ and when you're ready, move on to longer, free audio and video breathing exercises at morethanmedication.ca/smidge." When it comes to getting active, smidge™ advocates little changes that add up, like taking the stairs, a little more often. Take two extra flights of stairs a day and, over time, you'll improve your conditioning and feel stronger, confirms Montreal-based fitness expert and life coach Annick Robinson, a regular contributor to Pfizer's wellness site morethanmedication.ca. Just a few extra minutes of strength training and active movement every day, can help you continually improve your fitness in a gradual, sustainable way, adds Annick. "Good health takes more than information and facts, it takes commitment, optimism, healthy choices and motivational support that builds over time," says Ghislain Boudreau from Pfizer Canada. "Because when it comes to your health, the good news is that even a little smidge™ counts and this is Pfizer's way of helping Canadians build and maintain healthy habits — and start new ones." 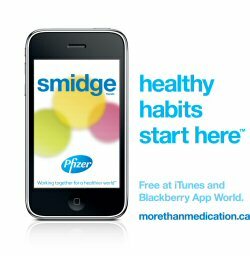 smidge™ is part of Pfizer Canada's More than Medication® program; a wellness awareness initiative that's devoted completely to non-medicinal health information. Pfizer medications are never mentioned. Canadians can visit morethanmedication.ca — Pfizer's free, made-in-Canada wellness site — for more information about smidge™ and a wide variety of audio, video and interactive health tools. smidge™ is available free at the iTunes and Blackberry App World stores. Pfizer Canada Inc. is the Canadian operation of Pfizer Inc., the world's leading biopharmaceutical company. The company is one of the largest contributors to health research in Canada. Our diversified health care portfolio includes human and animal biologic and small molecule medicines and vaccines, as well as nutritional products and many of the world's best-known consumer products. Every day, Pfizer Canada employees work to advance wellness, prevention, treatments and cures that challenge the most feared diseases of our time. We apply science and our global resources to improve the health and well-being of Canadians at every stage of life. Our commitment is reflected in everything Pfizer does, from our disease awareness initiatives to our community partnerships, to our belief that it takes more than medication to be truly healthy. To learn more about Pfizer's More than Medication philosophy and tools like smidge™, visit morethanmedication.ca. To learn more about Pfizer Canada, visit pfizer.ca. smidge™ and the tagline Healthy Habits Start Here™ are trademarks of Pfizer Canada Inc.
More Than Medication® and the morethanmedication.ca® website are registered trademarks of Pfizer Canada Inc.